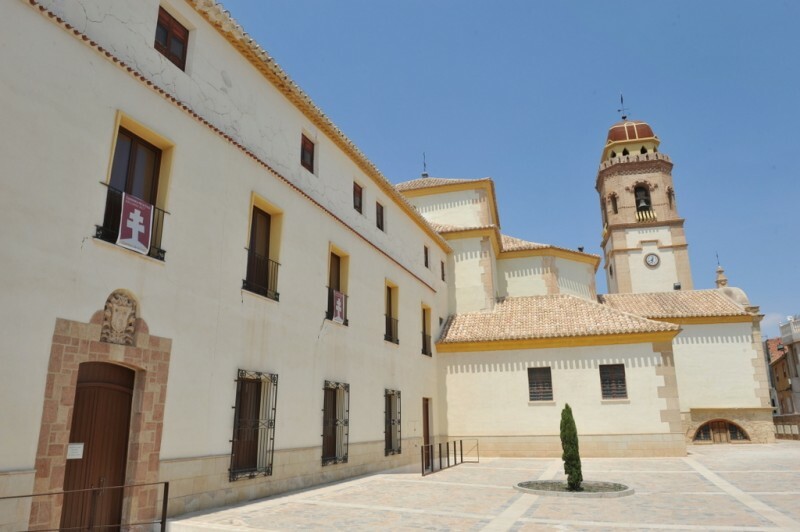 The convent and Sanctuary of the Virgen de las Huertas is outside the city centre of Lorca, on the southern side of the River Guadalentín, and is devoted to one of the patrons of the city, a legendary apparition of the Virgin Mary in the 13th century. 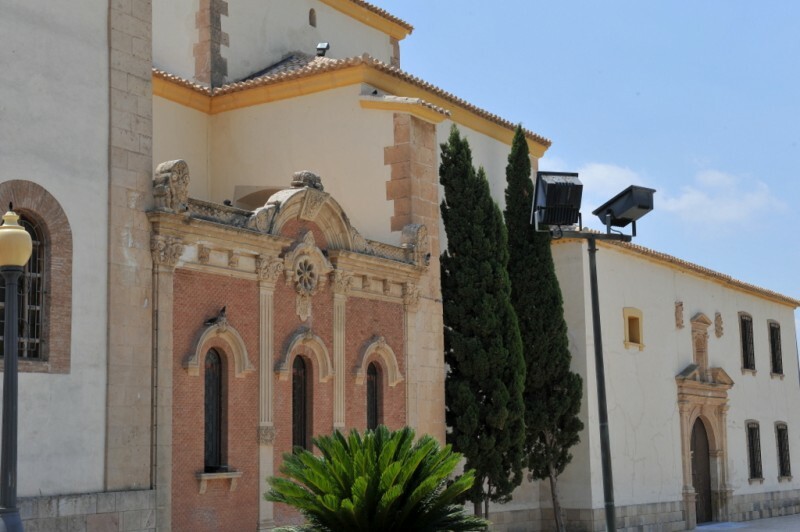 This is the only remaining functional Franciscan monastery in Lorca, and has acquired further significance since the discovery that it is built over the remains of a Moorish palace. The story of the Virgen de las Huertas runs that in the year 1244 Prince Alfonso of Castilla, later Alfonso X “El Sabio”, was camped in this area outside Lorca as he prepared to conquer the city from the Moors, and benefited from a thick fog which kept the movements of his troops hidden from the enemy. In his tent was an image of Mary, and in gratitude for her supposed intervention he decided to build a shrine so that she could stay in this location. The feast day of the Virgen de las Huertas is still celebrated in Lorca every 8th September, and although the previous statue of her was lost in the first year of the Spanish Civil War (1936) a replacement was soon provided by José Sánchez Lozano in 1942. 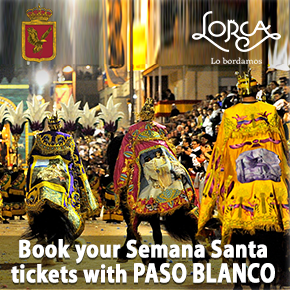 As part of the festivities the traditional “Feria Chica de Lorca” is held, and other events are organized by the brotherhood of the Virgen de las Huertas. However, the archaeological evidence now suggests that far from camping in the fields Alfonso in fact occupied the Moorish palace as his campaign headquarters, as he is known to have done at the castle of Monteagudo just outside the city of Murcia. The original church, which was built by the Franciscans in 1467 on the authority of a Papal Bull issued by Paul II the year before, was destroyed by flooding in 1653, although local tradition has it that the remains were used as the basis of the new construction and its tower. In reality, though, it seems that building had to start from scratch again: the main doorway, which is attributed to Lorenzo de Mora and Manuel Rodríguez Serrano, dates from 1690, while the cloister and the staircase to the upper floor are slightly older (1670). The ante-chamber of the camarin shrine was not completed until 1742, but at this point the Concejo (the city council) ran short of funds to complete the project. An alternative sponsor was found in the shape of the Marquesa de Santa Cruz, an aristocrat who is best known for being the subject of a portrait by the artist Goya. 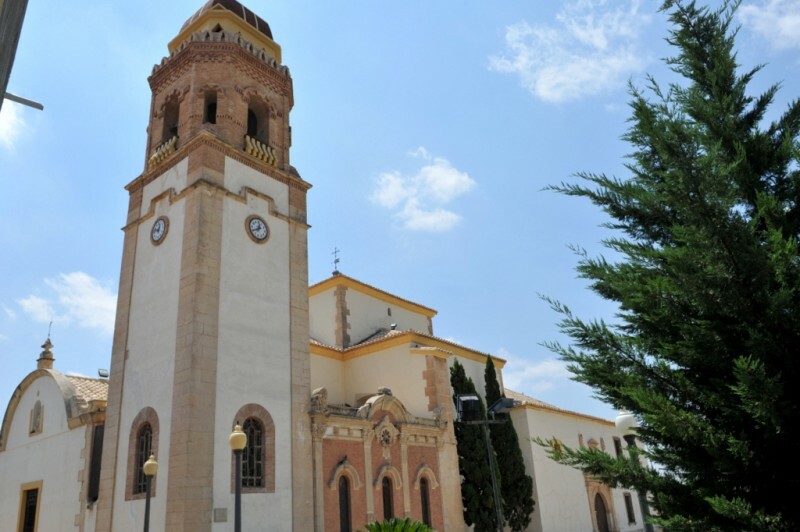 Some claim that she is buried beneath the church, and while she brought finance to the construction project the Concejo persuaded King Carlos II to establish the two-week fair in September so that visitors would come to Lorca and make donations of their own. But in 1835 the convent went the same way as others in Lorca, with the possessions of religious communities being confiscated and the monks being expelled from the city. This setback, though, was short-lived, as the building was bought by private owners and donated back to the Franciscans. Another setback came in 1901, when the tower collapsed, but by the following year it had been rebuilt and in 1903 the Condes de San Julián built their private chapel. In the year 2000 archaeologists gained permission to excavate inside the convent and church and discovered the remains of a 10th-century Moorish palace, and when repairs were made necessary by the earthquakes which hit Lorca on 11th May 2011 further elements of this palace were uncovered. 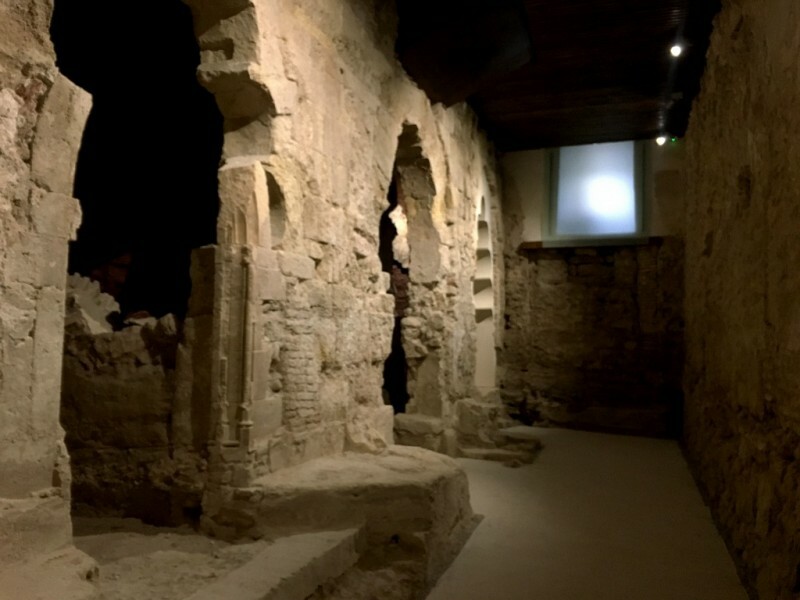 These Moorish remains can now be visited by prior arrangement on the first Saturday of every month under the terms of an agreement between the Franciscan Order and the Town Hall. In the meantime, the tower has been rebuilt since the earthquake, and other serious structural damage has been made good. The most eye-catching features on the exterior of the building are the bell-tower and the main doorway, which consists of a triumphal arch flanked by Doric columns and topped by a rectangular niche. This in turn is crowned with a triangular relief, and two coats of arms stand level with it but separate from the main piece. The chapel of the Condes de San Julián is the section finished in brickwork, and shows an eclectic style typical of the early 20th century, when it was built. Inside the church and the rest of the convent is one of the most complex collections of mural paintings in the Region of Murcia, dealing with topics as diverse as the history of the Francsican Order, the story of the Virgen de las Huertas and of the city of Lorca, and a set of images dedicated to the Virgen Inmaculada on the walls and dome of the “Tota Pulchra” staircase. These paintings were created during the reconstruction after the flood of 1653, and most date from between 1720 and 1760. The chief artists responsible were Baltasar Martínez Fernández de Espinosa and Antonio José Rebolloso Jiménez. Around the windows and in the dome of the church the main topics are the Immaculate Conception and the history of the Franciscan Order presented through the figures of its most exalted members. 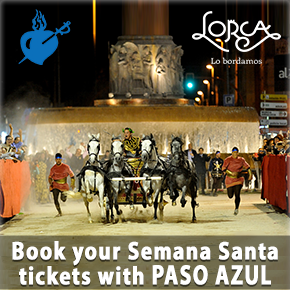 Four battles are represented in the crossing of the church, namely those of Novia de Serón, the Conquest of Lorca, the Battle of Los Cabalgadores and the Battle of Los Alporchones. The driving force behind the creation of these images in the 18th century was Father Pedro Morote, who also produced a series of sermons which are represented in pictorial form in the Tota Pulchra staircase. The main figures here are the Virgen de la Inmaculada Concepción, Santo Domingo and San Francisco. Apart from these murals other religious artwork in the sanctuary includes paintings by Muñoz Barberán and a 15th-century relief showing the Virgen de las Piedad. Some believe that this was part of the altar screen in the previous church, prior to 1653, and whether or not this is the case it is on the right as people enter from the square outside. Sánchez Lozano’s sculpture of the Virgen de las Huertas is a reproduction of the original which fell victim to the Civil War, and is the central figure of the Romería which is held every 8th September. One further item of interest is an elaborate marble tombstone which was carved by Mariano Benlliure in 1907, and which is in the crypt of the Condes de San Julián. 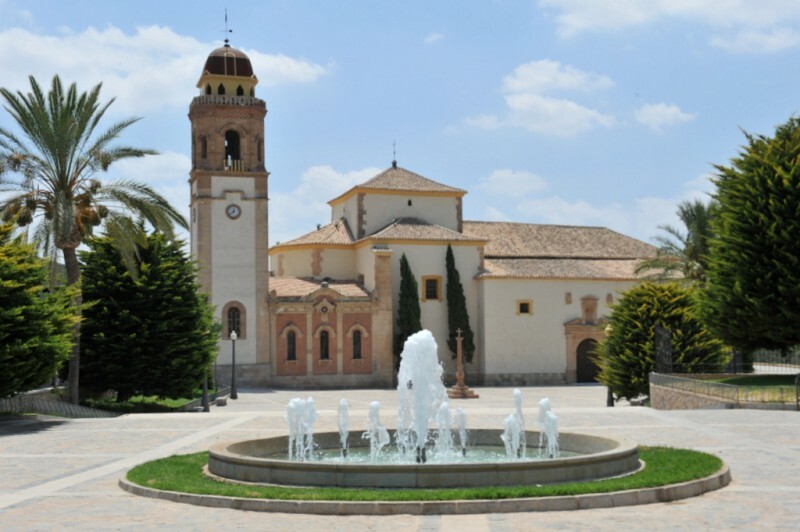 The Convento de la Virgen de las Huertas is situated in Plaza del Rey el Sabio outside the city centre of Lorca, and is best reached (by car) by crossing the river bed of the Guadalentín at the Puente de la Torta and heading right at the new Recinto Ferial de Santa Quiteria. After half a kilometre or so the tower of the church is visible on the right. 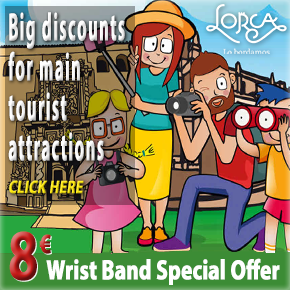 Those visiting on foot can do so from the centre of Lorca by walking through the “alamedas”, the leafy pedestrian avenues which lie to the east of the centre, and crossing the Guadalentín. Group visits can be reserved throughout the year, and special tours are being held on the first Saturday of every month starting in August 2017. 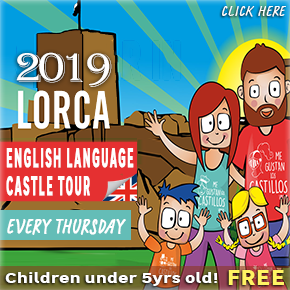 The cost of joining one of these visits is just 4 euros per person (children under 12 free of charge), and advance bookings (via the tourist office) are recommended.